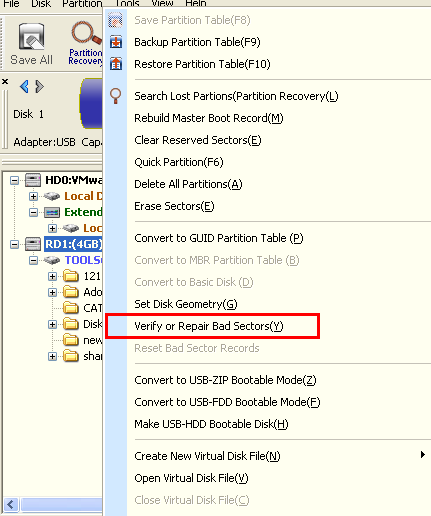 A bad sector is a sector on a computer’s disk that cannot be used due to permanent damage (or an OS inability to successfully access it), such as physical damage to the disk surface (or sometimes sectors being stuck in a magnetic or digital state that cannot be reversed) or failed flash memory transistors. How to check bad sectors? We need to use a specialized tool to check bad sectors. Here I’d like to take PartitionGuru as an example to show the steps. 1. 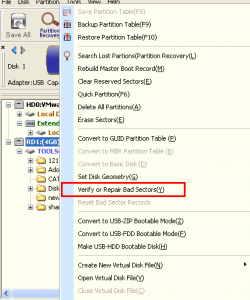 Launch PartitionGuru, right click the disk to be checked and select the item “Verify or Repair Bad Sectors “. 3. When the process is completed, PartitionGuru will report the bad sectors it finds. This entry was posted in Partition Manager and tagged bad sector check and repair software, bad sectors, check bad sectors, PartitionGuru, repair bad sectors by EASSOS. Bookmark the permalink.